You and your department have just completed operations at a challenging call involving hazardous materials, multiple below-grade extractions of injured patients, and medical care and transportation of those patients to the appropriate hospital. However, in addition to all those tasks, there are several more that await you, your fellow firefighters and EMS personnel once you return to the station. You must properly decontaminate all rescue and patient care equipment before returning it to service. Basic decontamination requirements are outlined in NFPA 472: Standard for Competence of Responders to Hazardous Materials/Weapons of Mass Destruction Incidents. Decontamination practices for EMS personnel can be found in NFPA 473: Standard for Competencies for EMS Personnel Responding to Hazardous Materials/Weapons of Mass Destruction Incidents, 2018 Edition. Here are some guidelines to help you and your crew in accomplishing this important task. Compatibility is an important word in hazmat operating site practices, and it is just as important for the decontamination process. Is the cleaning solution compatible with the material to be removed, and with the equipment being cleaned? 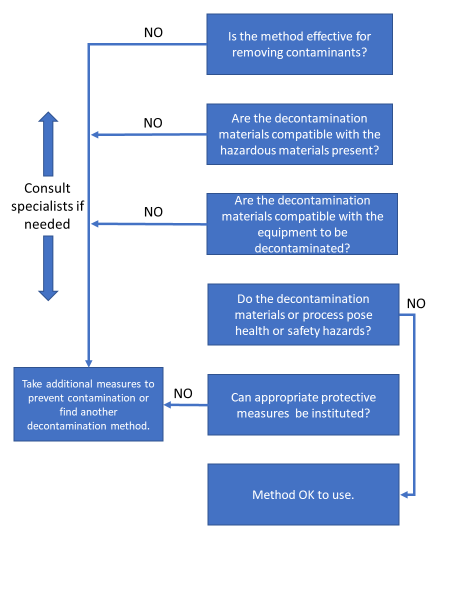 OSHA offers a flowchart to guide your department’s decontamination process. OSHA guidelines note the importance of consulting a specialist if needed. Emergency responders trained in hazmat response are familiar with the Chemical Transportation Emergency Center (CHEMTREC) and the protocol for contacting the organization for information and assistance during the response and mitigation of an incident. CHEMTREC can also connect you with manufacturers, shippers, consignees, carriers and government agencies to help ensure you’re using the right decontamination practices and products for the chemicals your equipment was contaminated by. They have access to a worldwide network of hazardous materials specialists, toxicologists, medical professionals and Safety Data Sheets, as well as a 24-hour emergency line (1-800-424-9300). Washing with soap and water. Using surfactants, such as detergent, makes contaminants dissolve more readily and reduces their ability to stick to surfaces – reduced viscosity. Dissolving contaminants in a solvent, such as water, alcohol or dilute acid, makes them easier to remove by washing and rinsing. Certain parts of medical care and rescue equipment – leather or cloth components – are difficult to decontaminate. If grossly contaminated, they may need to be discarded. Rubber components can be soaked in soap and water, and scrubbed with a brush, depending on the contaminant. Biomedical equipment, such as cardiac monitors or pulse oximeters, that’s been contaminated should be removed from service and quarantined until the original equipment manufacturer can be consulted for guidance and direction for decontamination or permanent removal from service. Use monitoring devices, such as photo ionization detector (PID), 4-gas meters, or colorimetric tubes. Wipe sampling using pH paper or chemical family-specific test strips.